Instruments: The instruments you are likely to hear us perform on include: guitar, fiddle, penny whistle, hammered dulcimer, concertina, hurdy gurdy, and didgeridoo, plus a grab bag of musical toys including jaw harp, clackamore, limberjack, spoons, and kazoo. 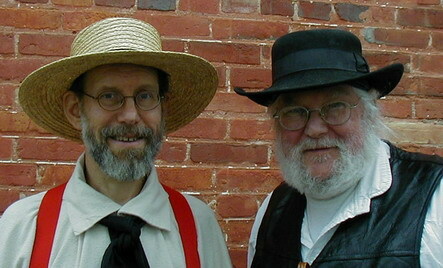 - numerous Civil War reenactments. Invitation: Audience participation is enthusiastically encouraged! Please stop by to say hi, and sing a song or two with us. View our 2014 schedule. If you are interested in getting e-mail updates to our schedule, please send Gary your e-mail address. Contact us by e-mail: Gary and Rob. -- This page is maintained by Gary Plazyk.